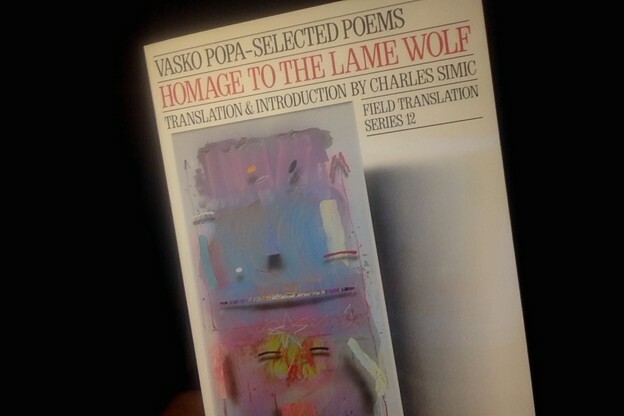 Bibliography: Homage to the Lame Wolf: Selected Poems, Vasko Popa, translated with an introduction by Charles Simic (Oberlin College Press, 1987). Comment: People who were baby poets in the 1980s, and who went to college at more or less shabby state schools—people who compose, in a word, my milieu—were all exposed to the anthology Another Republic: Seventeen European and South American Writers, edited by Charles Simic and Mark Strand (Ecco, 1976). The 1984 reprint of that book, with its emphatically drab cover and unappetizing title, was in every writing major's dorm room. It didn't have to be assigned to you by a prof; your friends would assign it. We all wanted to be Czech and Polish. A glance, this evening, at the Table of Contents confirms that Simic and Strand knew what they were about. Ponge, Pessoa, Parra . . . Celan, Ritsos, Calvino . . . these and almost every single one of the others in there are still being passed around. Vasko Popa, it so happens, is the next-to-last writer in the set—one of several in the glittering sequence who left me quite cold when I was twenty, twenty-one, twenty-two, twenty-three, twenty-four, twenty-five. The thing is I just reread the Popa pieces in the book (pages 213–227), this week, and they still don't do anything for me. So... no clue how I wound up buying the book pictured above. It may have been on principle. Whatever Simic translates—worth a look. Maybe I'd simply forgotten that Popa wasn't my kind of thing. Good thing I forgot. The sequence called "Homage to the Lame Wolf" (not present in Another Republic) answers some of my most pressing needs. Answers, and has answered, for twenty years. Favorite time I ever shared it with anybody was when I took it with me into Stateville Prison, here in Illinois. The guys got it right away: The humiliated are still gods. Approach with respect. Appendix: I had wanted to hunt up the original in Serbian, but I've run into the usual troubles. I ordered a print-on-demand selected Popa in Serbian, but they only selected the fifth section of the sequence. This gave me something to Google, true, but after two hours of fuss I had only assembled five of the seven parts. I don't know Serbian, so I can't check the stuff for even elementary accuracy. My one year of Russian, twenty-five years ago, was all I had to go on, which I think is like trusting your English to help you edit a text in Danish. If anybody wants to email me corrections, please do. I also need sections 3 and 7.